Ozbizweb Group win the MAPA award for Excellence in Small and Mid-Market Cloud Solutions! At last week’s 2015 Microsoft Australia Partner Conference, Ozbizweb Group took out the MAPA award for Excellence in Small and Mid-Market Cloud Solutions. See the video below for the announcement. This year we based our submission on a SharePoint Online/Office 365 solution for AUS Recruit, a Gold Coast based athlete recruitment company. AUS Recruit secure scholarships for Australian athletes in the American College system, and use SharePoint Online and custom workflows to automate their business processes. The solution also highlighted our use of Azure Logic apps to automate our own business processes, and the Office 365 APIs to provide an integrated support experience via the Office 365 App Launcher. We followed up the conference with our first Breakfast event featuring Microsoft Australia’s Brett Fraser. This was the first event we’ve hosted and we received some fantastic feedback from our 50+ guests. 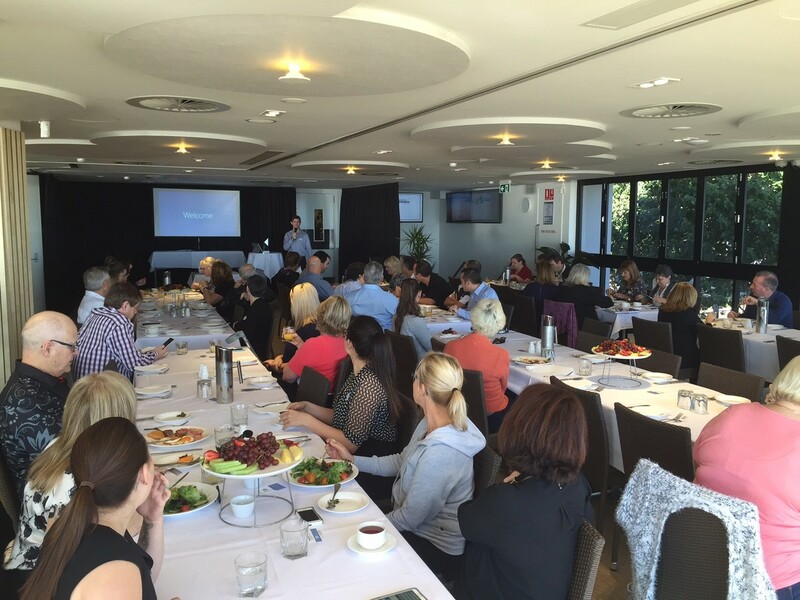 We’ve left the Australia Partner Conference with some great ideas for the year ahead. If you’d like to know more about how you can put the Microsoft Cloud to work for your business, get in touch! 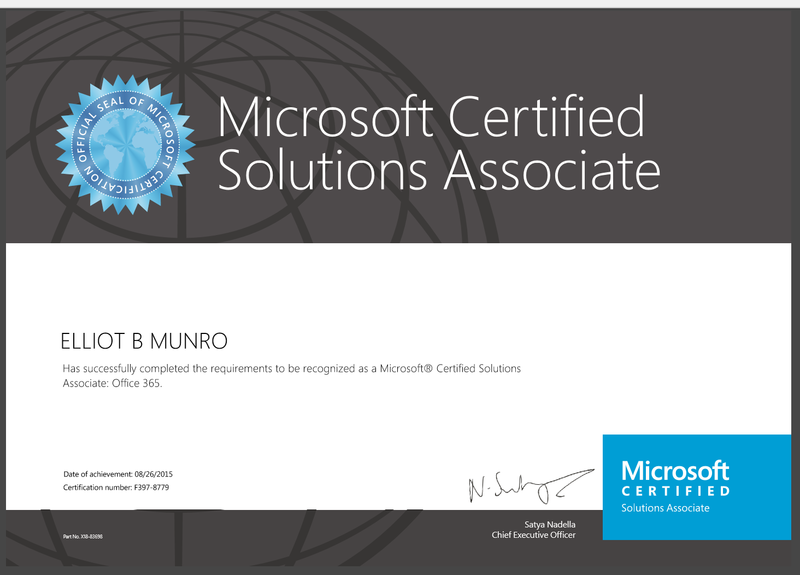 In order to stay up to date with our Microsoft Partner competencies and maintain our Gold Partner status, we have to complete the relevant Microsoft Exams. This year, we wanted to secure the Gold Small and Mid-Market Cloud Solutions competency since we’d satisfied the Office 365 performance requirements. 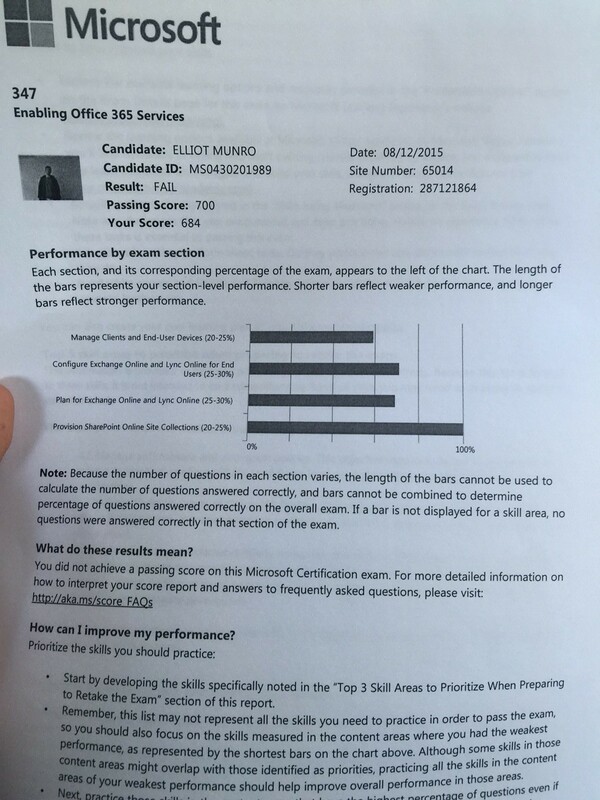 The only thing standing in our way was two technicians passing exam 70-347: Enabling Office 365 Services. From the moment I started collecting study materials, I knew that this would be hard. 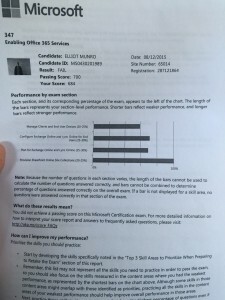 I’ve deployed and administered Office 365 for about 3 years now, though there seemed to be a lot of people with similar experience who didn’t make it. 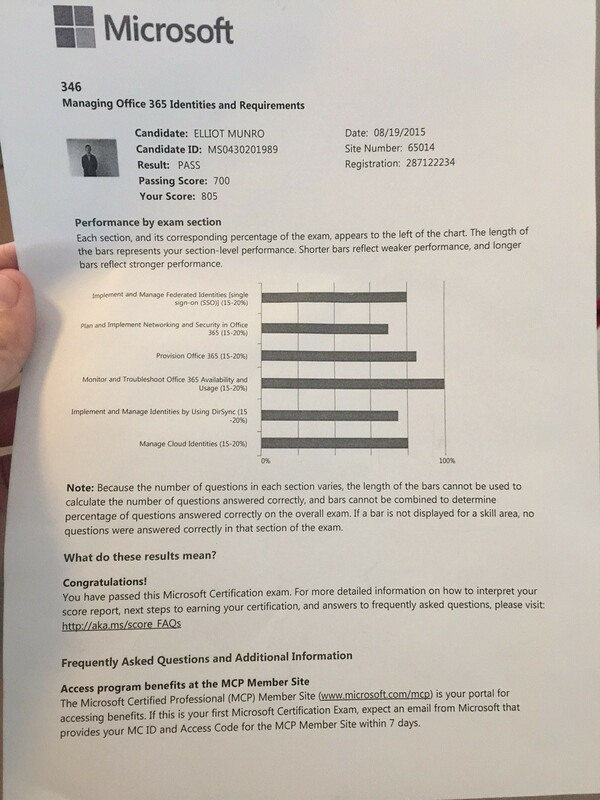 Forums were filled with people reporting failures and discussing how difficult the exam was. 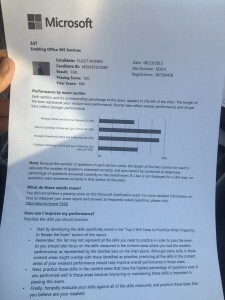 The official prep video from TechEd says from the outset – these are much harder than earlier exams, if you don’t do this for a career, we want you to fail (paraphrasing). 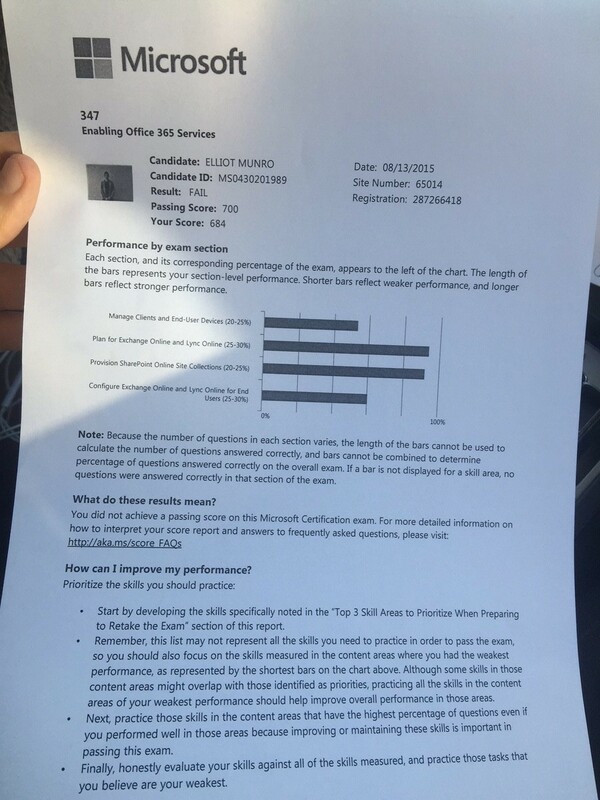 So long story short, I sat 70-347 twice, and failed twice. The passing score is 700/1000 with 54 to 55 questions, and both times I scored exactly 684! I couldn’t believe I’d missed out by what looked like one question. 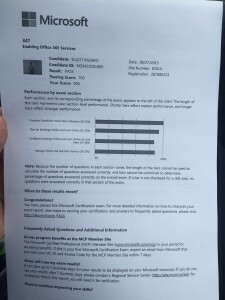 After these failures I couldn’t rebook for another two weeks, so I decided to study up on 70-346: Managing Office 365 Identities and Requirements. I used CBT nuggets and a couple of MVA video series. Luckily I sat and passed this one the first time. While waiting for my re-do of 70-347 I studied the following things. Hopefully this can serve as a bit of a study guide. These videos help you understand how to create and manage SharePoint online site collections via the portal and Powershell. I couldn’t find a video series for this one, though you can browse and test the Powershell cmdlets for Skype for Business and see how they differ from the other services. There’s a few pre-requisites for getting connected to Azure AD via Powershell, see this link for more info. This was something I struggled with since I’d never rolled it out before. Try to understand the requirements of the different components of the Telemetry dashboard. Log onto http://portal.office.com as an administrator and pay attention to the features of the Exchange, SharePoint and Skype for Business Admin portals. 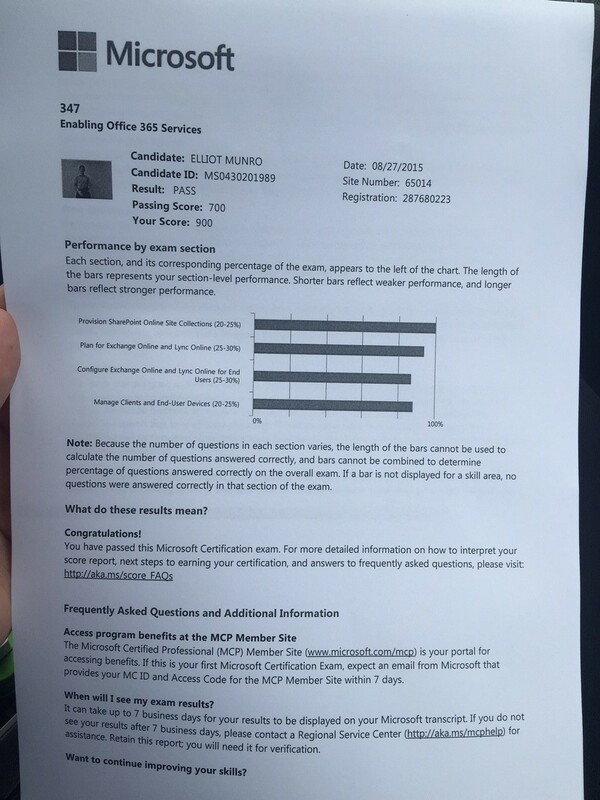 After the two weeks was up I resat the exam and scored 900/1000 and completed the requirements to be a Microsoft Certified Solutions Associate: Office 365. 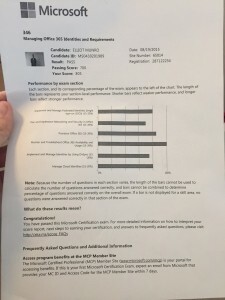 While I found these exams to be really challenging, they gave me exposure to areas of Office 365 and its included services that I hadn’t explored. I’ve grown to appreciate the power and speed of Powershell, and I’m now using it instead of the portal for lots of tasks. Ozbizweb Group are finalists again! The finalists for the 2015 MAPA awards were announced this week, and we’ve received a nomination for Excellence in Small and Mid-market Cloud Solutions! The project we based this years’ entry on was an Office 365 and SharePoint Online customisation for AUS Recruit. AUS Recruit are an athlete promotion agency that secures scholarships in the American college system for Australian athletes. This is the second time we’ve made it to the MAPAs, last year in the Small Business category. We missed out that time to our friends at XCentral (who were also nominated this year for Excellence in Managed Services). Like many businesses with Office 365, we use SharePoint Online quite a bit for business intelligence, process automation and document/data storage. We also use other cloud applications like Xero for cloud accounting. Though we were looking for a way to connect our separate cloud tools together to cut down on double handling of data and automate our invoicing. We first tried to get the solution working entirely via a SharePoint workflow in SharePoint Designer. It wasn’t long before we gave up on this approach because we didn’t know how to do the initial authentication of the web service calls to Xero from SharePoint Designer. 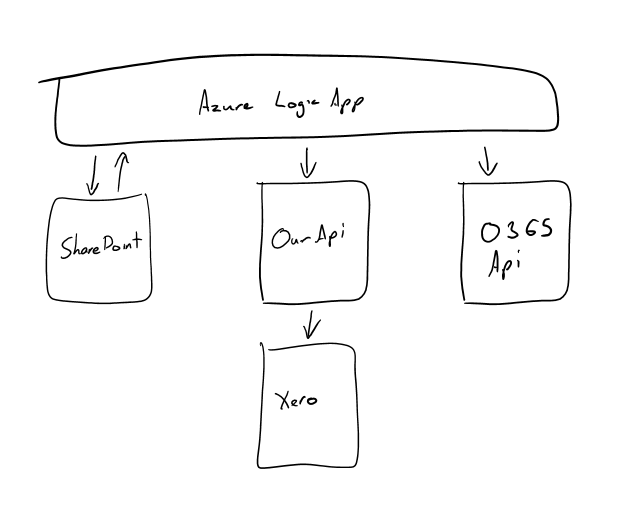 The Xero Developer Center provides some good documentation and guides on configuring apps to connect to Xero organisations, so we decided to build a web API on Microsoft Azure in conjunction with a SharePoint workflow to pull this off. All the OAuth authentication work is done by the API, and we can send all our calls with a client ID and Secret from SharePoint Designer with a web service call. The API is designed to service multiple customers, so we can provide this as a service to our customers who want to connect SharePoint to Xero. We weren’t too fussed on the idea of storing the Xero Client ID and secret in SharePoint Designer, where it can be viewed by any user who can open workflows. 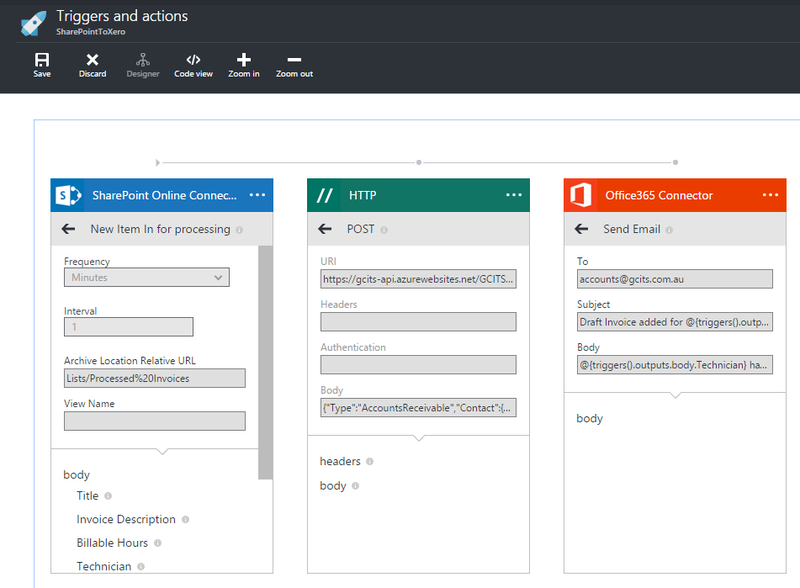 Configuring the solution for multiple customers would mean setting up and supporting these SharePoint Designer workflows across multiple organisations. Ideally we would have a way to coordinate the flow of data between SharePoint and our API from a secure, centralised location – and, although we’re messing about with the Office 365 APIs, we’re not the most experienced developers. The solution to our problem came with the announcement of Azure Logic Apps back in March. This gave us the perfect way to orchestrate the authentication and flow of information between the services. Our Azure Logic app monitors a designated SharePoint list for a new item (invoice), and once triggered, will initiate a HTTP call against our API with the relevant invoice information. 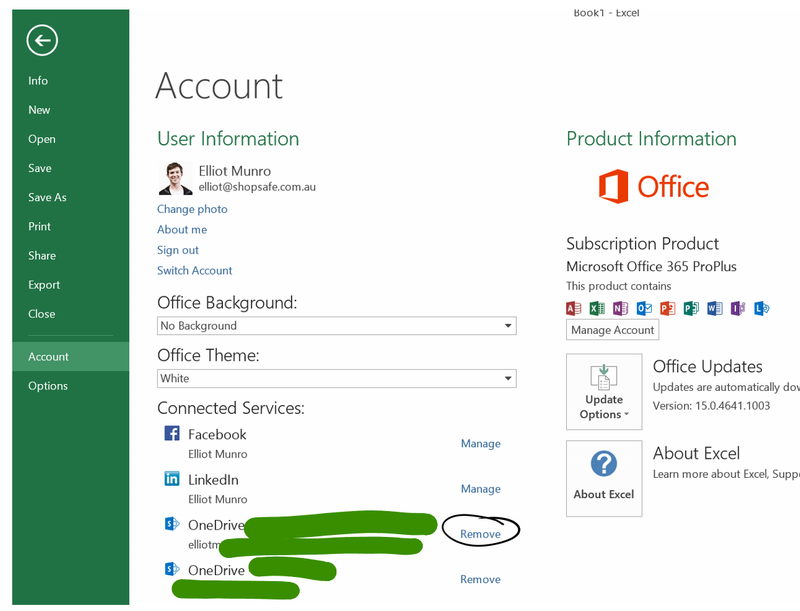 We also added in a notification email step using the built-in Office 365 API app. Remote support technicians complete a job. 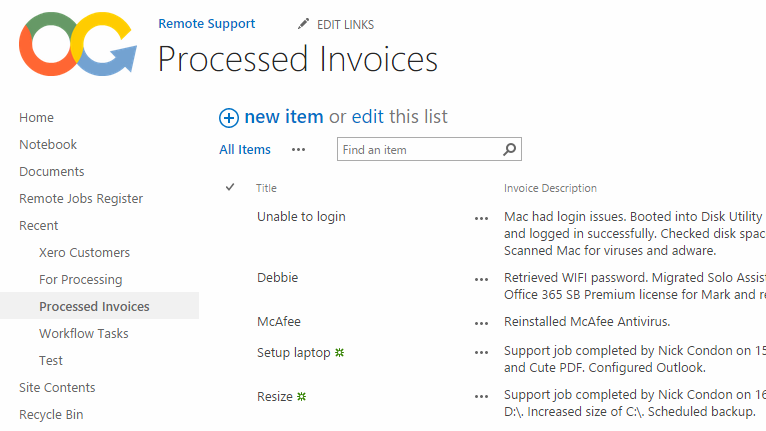 If the customer is not on a support contract, a SharePoint workflow creates a new item in a separate SharePoint list for processing with all the information required for invoicing. 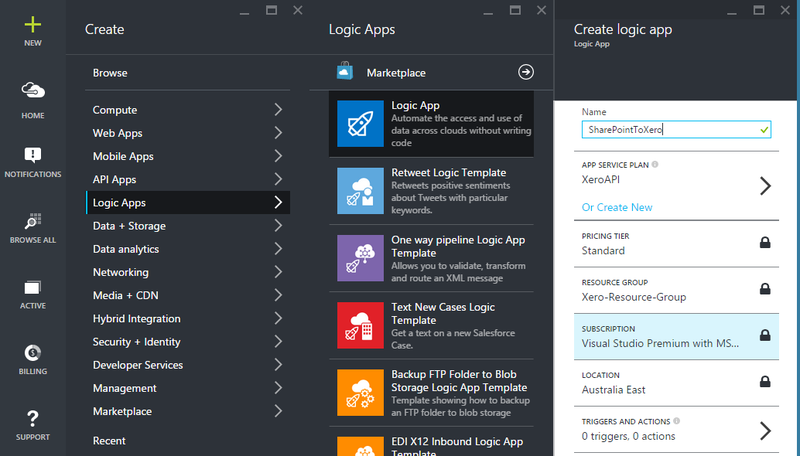 The Azure Logic App checks the list every minute, and when it finds a new item, pulls the information and populates a HTTP POST call in the format required by Xero. 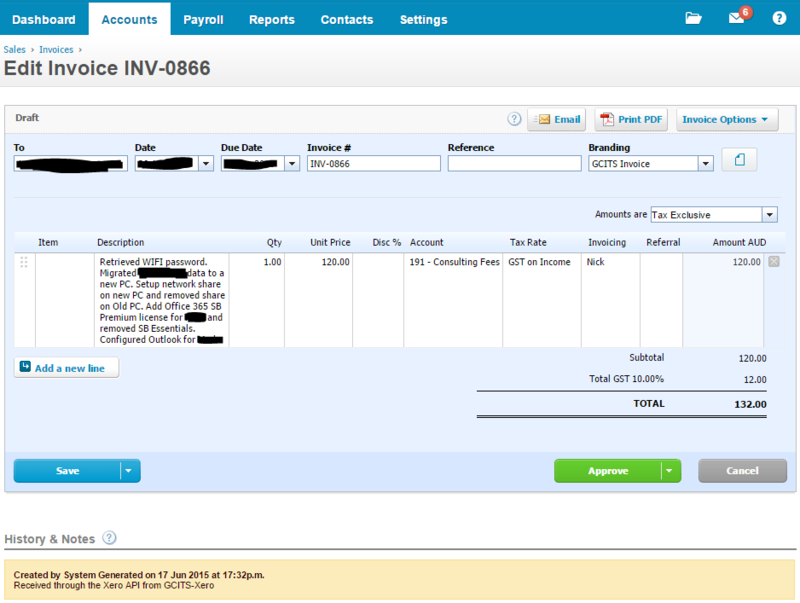 This creates a draft invoice in Xero, where it can be approved later. After an invoice is created successfully, a notification email is sent to let us know there’s an invoice awaiting approval. Since it’s running in Azure, we can set this solution up for other customers, and manage everything from the Azure Portal. The Xero Client ID and Secret is stored in a central, secure location. 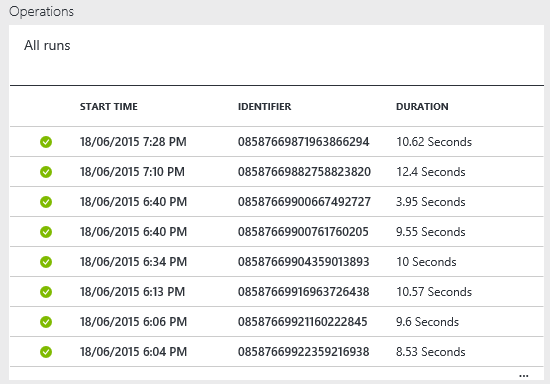 Azure Logic Apps provide detailed reporting on the success/failure of previous runs. This was extremely helpful during the initial setup. No double handling of data between clouds and no missed invoices! Here’s a draft invoice created in Xero by the Logic App and our custom API. We’ve also set it up to work with our custom tracking fields, so that the technician who completed the job in SharePoint is recognised in Xero. Have some other ideas? Get in touch! What is Azure RemoteApp and why should I care? If a custom application is holding you back from completely transitioning to the cloud, then RemoteApp might be the answer. 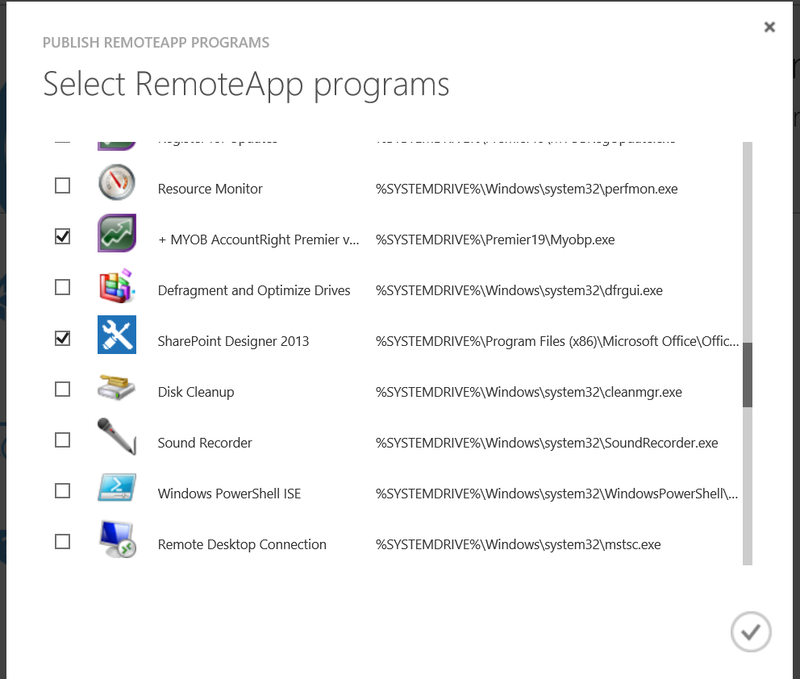 What can RemoteApp do for me? 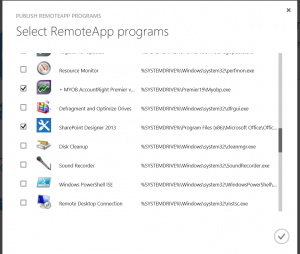 RemoteApp can serve individual applications from the cloud via the Remote Desktop Protocol. This means that users can access custom and legacy line of business applications from anywhere and almost any device – without the need for a server. Microsoft Azure RemoteApp is currently in preview and it looks like a great alternative to hosted desktop for many organisations. How is this different from standard Remote Desktop? Technically, it’s not so different. Azure RemoteApp runs on the remote desktop protocol and it’s built into the Remote Desktop apps on iOS and Android devices. The difference between RemoteApp and Remote Desktop is that you are only serving a particular application, or set of applications, to the end user. You don’t have to worry about maintaining a server, configuring complex permissions or setting up remote access. Everything can be managed simply via the Azure Portal. How do you give access to users? The coolest thing about RemoteApp is how easy it is for users to access, and administrators to administer. Azure RemoteApp lets you assign programs to users via their personal Microsoft Accounts (their own email, Hotmail, Live, Outlook.com etc), or their Azure Active Directory credentials. Side note: If you’re using Office 365, then you already have Azure Active Directory setup. When you sign up for Azure using an Office 365 admin account, you’ll be able to administer your Office 365/Azure Active Directory from the Azure portal. This is really handy if you want users to be able to access their Azure RemoteApp programs using the same credentials that they use for Office 365. What sort of applications can it serve? Azure RemoteApp is perfect for those custom line of business applications that would usually require their own server. The current preview gives us a standard set of Microsoft Office Applications – but what if you want to provide your own custom industry-specific application like MYOB, Handisoft, Console, Realworks, Medical Director or Best Practice? 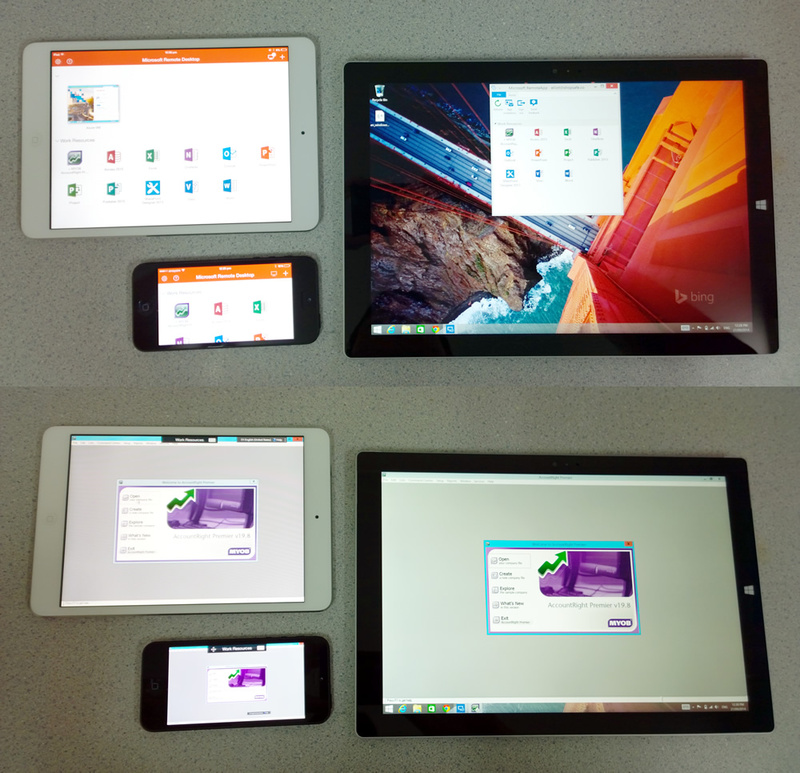 RemoteApp requires that we upload our own custom image with the programs preinstalled and configured. 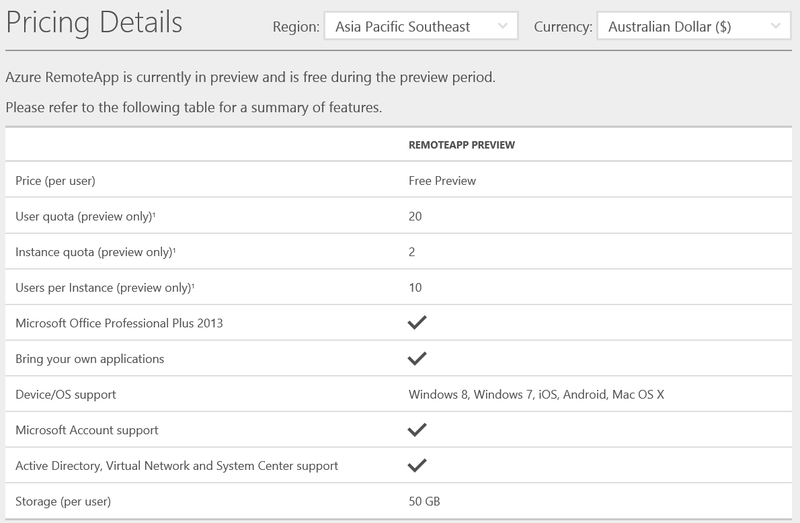 Once it’s uploaded, RemoteApp will search the image for applications that you can publish. It’s as easy as ticking a few boxes and typing in the email addresses of the users that need access. How do I access my RemoteApp Programs? RemoteApp programs can be accessed from anywhere with an internet connection on PC, Mac or almost any device. You can download the RemoteApp Client for PC and Mac here. iOS and Android users can use the Remote Desktop App to access their RemoteApp applications by signing in. 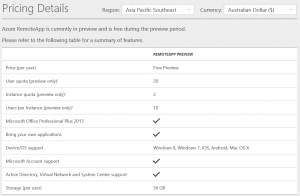 Azure RemoteApp is currently in preview, which means it’s free to try right now. I’ll update this post when pricing information becomes available. What if I need help setting it up? Contact us! Type your question into the Enquiry form below and we’ll be in touch! 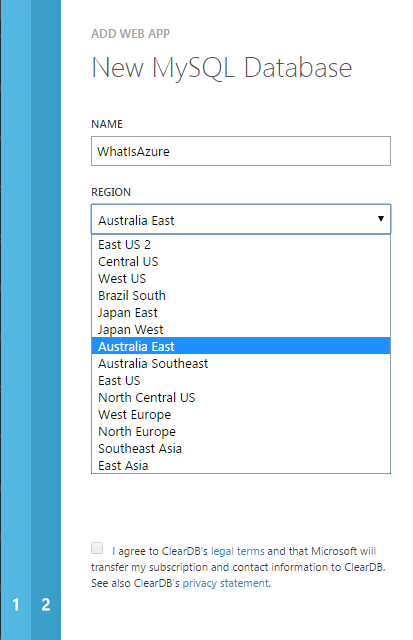 Are the Australian Azure Datacentres available now? Not entirely, but soon! The official word at the Microsoft Australian Partner Conference was that the Australian Azure Datacentres would be online before Christmas. The unofficial word was early October. I also heard someone say the sixth of October, but that could have been a lie. Note the presence of Australia East and Australia Southeast! Azure’s MySQL databases are actually managed by a company called ClearDB, though they still run on Azure’s hardware. I’m not sure what’s happened here – it may be intentional, though perhaps ClearDB has let the cat out of the bag a little early. It might just be limited to MySQL databases. I tried creating a Virtual Machine straight away, though the closest datacentre is still Southeast Asia. I ordered a Surface Pro 3 from the Microsoft Store after trying one at the Microsoft Australia Partner Conference. It arrived last week and I put together a little video because it’s more interesting than a photo. The setup was very simple and if you’ve used Windows 8/8.1 before with a Microsoft Account, all your settings move with you. When it turned on, I had the same apps, desktop background and email accounts setup as on my other computers. As a device, it’s an incredible piece of technology – It’s about as thin as an iPhone 5s and it’s more powerful than my desktop PC. It’s an i7 with 8GB of RAM, a 256gb SSD and the kind of build quality that you’d expect from Apple. The first thing you notice is the quality of the display, it’s really, really nice to look at. It takes pen and touch input and, unlike the Surface Pro 1 and 2, it’s got a 3×2 aspect ratio – so it’s easy to hold it any way you like. More importantly than any of that, the device is great because it allows you to work, create and play without limits. It can replace your laptop, your tablet and your desktop PC. Use it with the docking station on 3 HD monitors, take it on a plane for mobile productivity, make handwritten notes that sync with all your devices or pick up an Xbox wireless controller for gaming. Microsoft are marketing the Surface Pro 3 as the tablet that can replace your laptop. And that’s a pretty accurate claim – I’m still carrying around an extra iPad for customer demos, though I’m no longer using it outside of work. The Surface Pro 3 is the embodiment of Microsoft’s Mobile first, Cloud first vision. A great ‘everything’ device that runs everything that you want it to, whenever and wherever you need it. Would be nice if it had an LTE option for mobile internet – though it hasn’t been an issue tethering it with a phone or 4G modem. 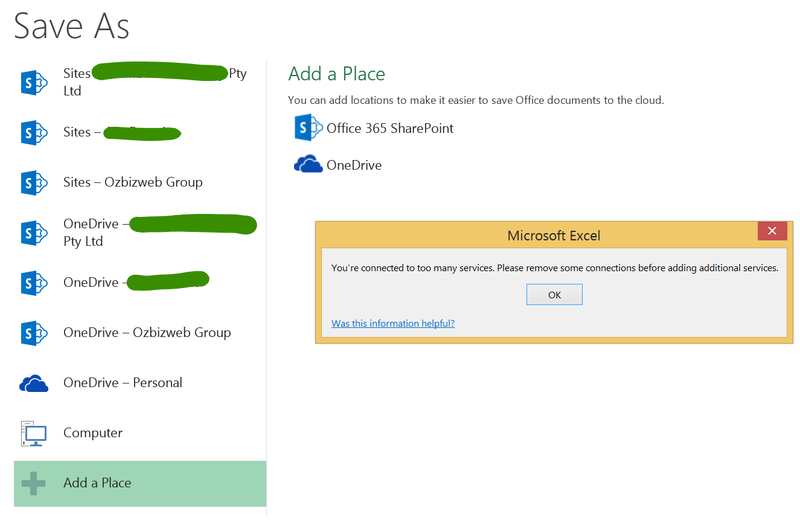 This message might appear when you try to add a SharePoint Site, OneDrive location or even connect your Office Applications with Facebook or LinkedIn. Unfortunately it looks like this is a limitation in Office, though it’s not too difficult to resolve. The Microsoft Australia Partner Conference of 2014 finished last week, and we were up for a MAPA award in the Small Business Partner of the Year Category. Unfortunately we didn’t win, though congratulations to X Central for their winning customer solution (which was also nominated at the World Partner Conference in Seattle!). This year we are looking forward to deploying some great solutions around Microsoft Azure. We’ve been doing a lot of testing internally and it’s an incredible platform with so many possibilities. Speaking of platforms, Office 365 development is another big opportunity. Our SharePoint work has gone through the roof in the last couple of months and there is a lot more of it on the horizon. SharePoint Online is a hugely underutilised aspect of Office 365, and it could be the most valuable business tool you’ll ever use. Keep an eye out for a few of our case studies in the next few weeks. 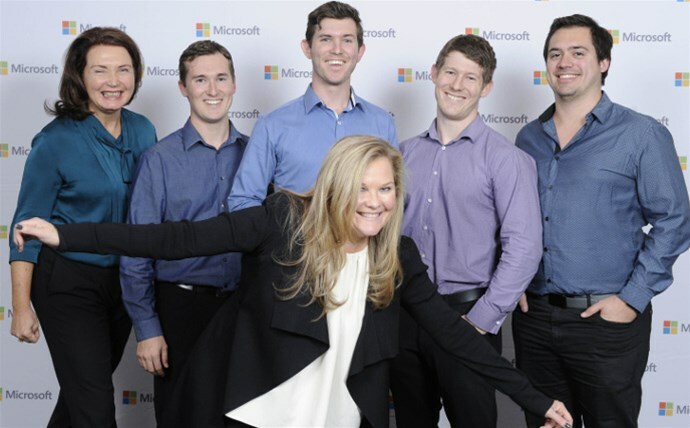 Ozbizweb Group – Finalists in the 2014 Microsoft Australia Partner Awards! Each year, the Microsoft Australia Partner Awards (MAPA) recognise top Microsoft Partners for delivering market-leading customer solutions built on the Microsoft Platform. 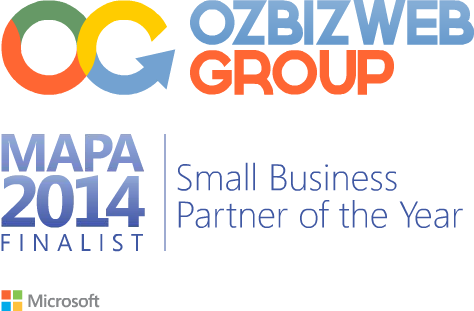 Today the Ozbizweb Group was announced as Small Business Partner of the Year finalists for MAPA 2014. Our entry was based on the Microsoft Cloud solution that we delivered for Australian Tourist Park Management. See the video below. For this customer, we built a solution that was scalable, easy to administer and powered by the cloud. We consolidated their existing remote and on-site IT systems onto a single platform with Windows Intune, helping us to reduce costs and simplify IT management. We used Office 365 to replace their on-premise Exchange Server, save on Office software and allow for better communication and collaboration. The end result was a solution that saved money, reduced downtime and increased productivity. We’ve saved over $500 per month across all our workstations on software alone, while at the same time increasing software functionality and the productivity of our staff. If you’d like to know how a cloud solution could help your business, reach out to us today. It costs you nothing, and we’d love to have a chat.